Location: South of Aberchirder, Aberdeenshire, Scotland. Built: 14th and 16th centuries. Condition: Intact. In use as accommodation. Notes: Kinnairdy Castle is a tower house, having five storeys and a garret, two miles south of Aberchirder, Aberdeenshire, Scotland. The alternative name is Old Kinnairdy. The castle is built on land that belonged to the Innes family from the late 14th century; an earlier tower was probably built in about 1420, that replaced a wooden motte and bailey structure. 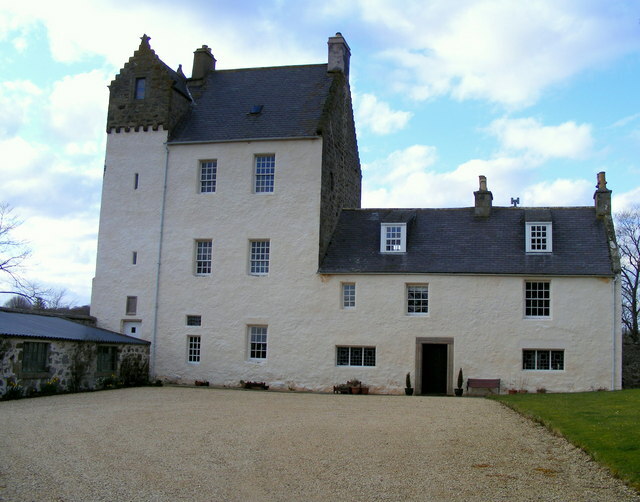 The castle was sold by the Innes family to Sir James Crichton of Frendraught in 1629. Subsequently it came to the Reverend John Gregory in 1647, then passed to his brother David, a doctor who has been claimed to be constructor of the first barometer. David's success in forecasting the weather with the help of the barometer led to his being accused, but not convicted, of witchcraft. The property was sold by his third son to Thomas Donaldson, a merchant from Elgin, who restored and re-roofed the castle during the eighteenth century, transforming it into a country house. The property returned to the Innes family in 1923, and they began restoration then.